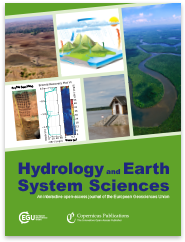 Hydrology and Earth System Sciences (HESS) is an international two-stage open-access journal for the publication of original research in hydrology. 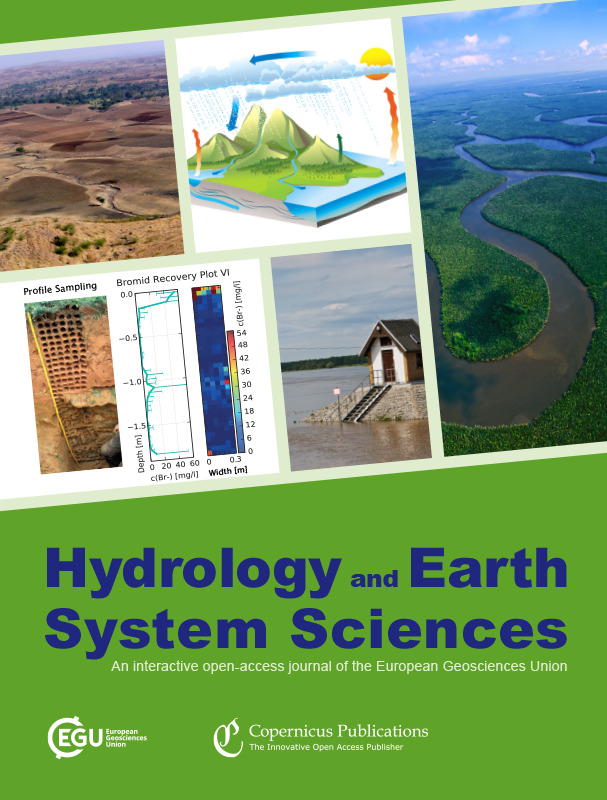 HESS encourages and supports fundamental and applied research that advances the understanding of hydrological systems, their role in providing water for ecosystems and society, and the role of the water cycle in the functioning of the Earth system. A multi-disciplinary approach is encouraged that broadens the hydrological perspective and the advancement of hydrological science through integration with other cognate sciences and cross-fertilization across disciplinary boundaries. We evaluated trends (1984–2016) in riparian wetness across the Upper Missouri River Headwaters Basin during peak irrigation months (June, July, August). We found that 8 of the 19 riparian reaches across the basin showed a significant drying trend from 1984–2016. The temporal drying trends persisted after removing variability attributable to climate. Instead, the drying trends co-occurred with a documented basin-wide shift towards center-pivot irrigation. There is a growing need for information about possible changes to water resource availability in the future due to climate change. Large-scale outputs from global climate models need to be translated to finer resolution spatial scales before hydrological modelling. Biases in this downscaled data often needs to be corrected. We show that usual bias correction methods can retain residual biases in multi-day occurrences of rainfall, which can result in biases in modelled runoff. This study investigates the impact of dam-induced hydrologic alterations and modification of riparian buffers on stream temperatures and thermal habitat for aquatic species. We enhanced and applied a model system (DHSVM-RBM) that couples a distributed hydrologic model, DHSVM, with the distributed stream temperature model, RBM, in the Farmington River basin in the Connecticut River system that includes varying types of watershed development (e.g. deforestation and reservoirs). This study presents how the concept of uncertainty analysis can be applied to river engineering problems and how important it is to understand the limitations of numerical models from a probabilistic point of view. We investigated floodplain friction formulations from the point of view of uncertainty analysis in order to include those limitations in the final results. This kind of analysis is planned to be integrated in future projects and also extended to morphodynamic studies. 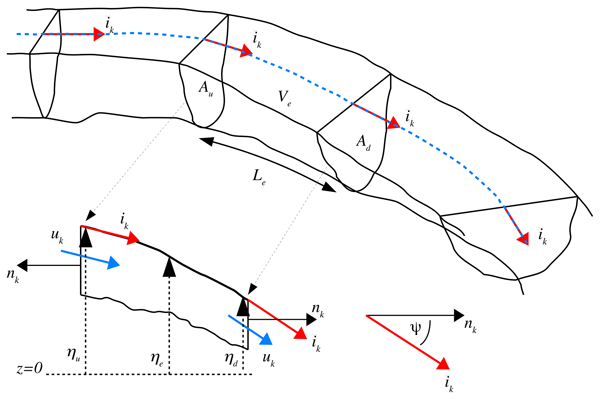 Numerical models of wormhole formation in fractured porous media provide basic insights on the evolution of complex conduit systems in karst aquifers. In this work we use a time-propagating reactive flow model to explore the evolution of wormholes in a 2-D grid of fractures. We demonstrate physically meaningful mechanisms leading to the formation of individual wormholes and the competition between a set of evolving wormholes. Many variables, e.g., in hydrology, geology, and social sciences, are only observed at a few distinct measurement locations, and their actual distribution in the entire space remains unknown. We introduce the new geostatistical interpolation method of quantile kriging , providing an improved estimator and associated uncertainty. It can also host variables, which would not fulfill the implicit presumptions of the traditional geostatistical interpolation methods. In August 2017 Bangladesh faced one of its worst river flooding events in recent history. For the large Brahmaputra basin, using precipitation alone as a proxy for flooding might not be appropriate. In this paper we explicitly test this assumption by performing an attribution of both precipitation and discharge as a flooding-related measure to climate change. We find the change in risk to be of similar order of magnitude (between 1 and 2) for both the meteorological and hydrological approach. Several multivariate bias correction methods have been developed recently, but only a few studies have tested the effect of multivariate bias correction on hydrological impact projections. This study shows that incorporating or ignoring inter-variable relations between air temperature and precipitation can have a notable effect on the projected snowfall fraction. The effect translated to considerable consequences for the glacio-hydrological responses and streamflow components of the catchments. 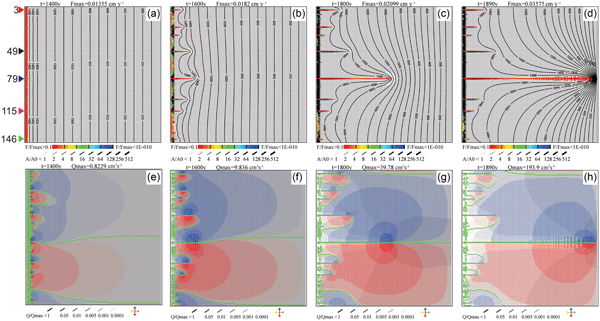 A new derivation of the equations for one-dimensional open-channel flow in rivers and storm drainage systems has been developed. The new approach solves some long-standing problems for obtaining well-behaved solutions with conservation forms of the equations. This research was motivated by the need for highly accurate models of large-scale river networks and the storm drainage systems in megacities. Such models are difficult to create with existing equation forms. 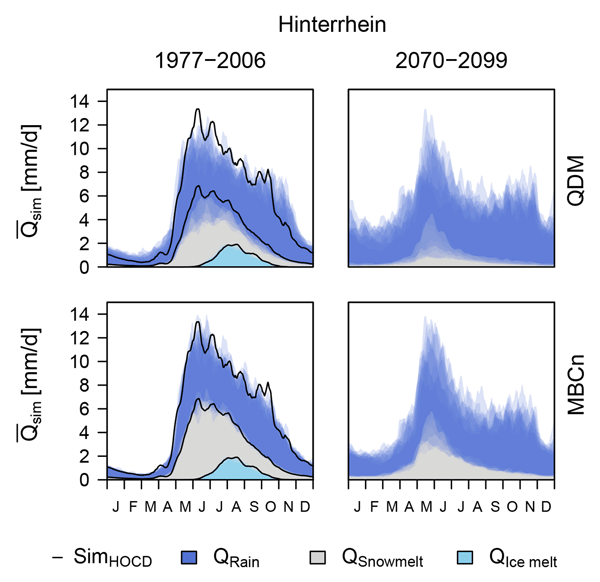 We used stable isotopes of xylem water to study differences in the seasonal origin of water in more than 900 individual trees from three dominant species in 182 Swiss forested sites. We discovered that midsummer transpiration was mostly supplied by winter precipitation across diverse humid climates. 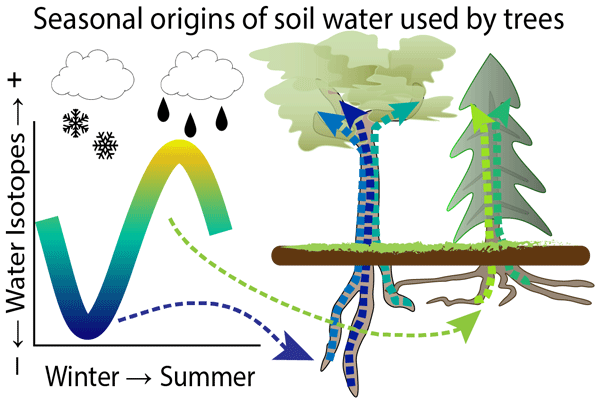 Our findings provide new insights into tree vulnerability to droughts, transport of water (and thus solutes) in soils, and the climatic information conveyed by plant-tissue isotopes.